Now for another central agency change as Burgess tell me they've taken over the central listing for sale of the 52.5m motor yacht Blue Scorpion. Built in 2006 by Baglietto to Lloyds class and MCA compliant, she was refitted as recently as 2013 and her elegant Zen-inspired interior by Francesco Paszkowski accommodates 12 guests in six staterooms. The main deck master suite is full beam and has walk in wardrobes, his and hers en suite bath and a 50 inch plasma television screen while two identical VIP staterooms each have a safe, mini bar, 27 inch television screens and en suite showers. A further two twin cabins come with 20 inch television screens and have en suite showers. Deck spaces are extensive with a Jacuzzi on the sun deck and a fully equipped gym on the upper deck which converts to a further VIP stateroom. Twin 2,700hp Caterpillar engines give Blue Scorpion a cruising speed of 15 knots and a range of 4,500 nautical miles at 12 knots. 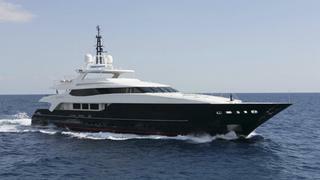 Blue Scorpion is asking €17.5 million.